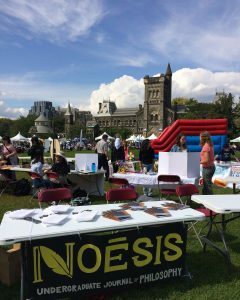 The Noesis journal staff set up a table at 2016 Club Day, which features all U of T Students’ Union officially-recognized clubs and student groups. 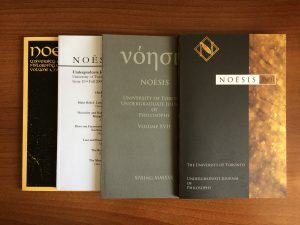 Noēsis is the University of Toronto’s Undergraduate Journal of Philosophy. We have been entirely organized, managed, and edited by undergraduate students since our first edition in 1998. Every year, we publish some of the best philosophical works produced by our peers, many of whom have gone on to pursue graduate work in philosophy. To give undergraduate students the tools they need to create a polished paper, we also run workshops throughout the year. At our events, you can meet other undergrads interested in philosophy, improve your writing for your classes, and gain valuable insight into what our editorial team looks for when reviewing papers. To learn more about Noēsis, or to submit a paper to the journal, visit our website.